With a new location and an expanded layout the festival’s Christmas Market has over 100 stalls selling the best Cornish produce. There will be artisan breads, juicy jams, tangy cheese and Cornish charcuterie. Cornwall’s breweries will also be out in force with festival sponsors Sharp’s bringing their Cornish Pilsner which was officially named the World’s Best Lager at the 2013 World Beer Awards. There’ll be crafts too, with handmade jewellery, paintings and handbags. If you aren’t already drooling at the thought then this might just tip you over the edge: outside pop-up food stands will be selling the ever popular Blas Burgers, delicious Dollies Donuts and Wild Bake wood-fired pizzas. Padstow’s Christmas Market will be open from 2pm on Thursday 5 December, and from 10 am from Friday 6 to Sunday 8 December. Bin Two is an independent wine merchant, Champagne bar and coffee shop tucked away in The Drang, just off Padstow’s harbour side. Every year during the festival weekend, Bin Two host carols around the Christmas Tree. 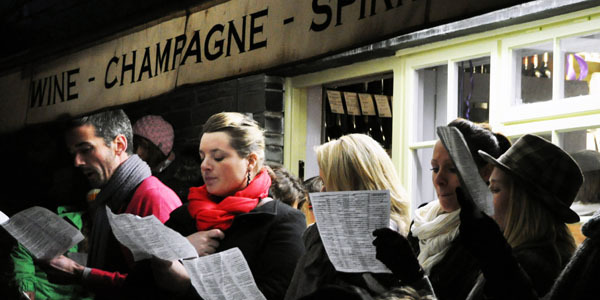 Make sure you get there early to bag a song sheet. 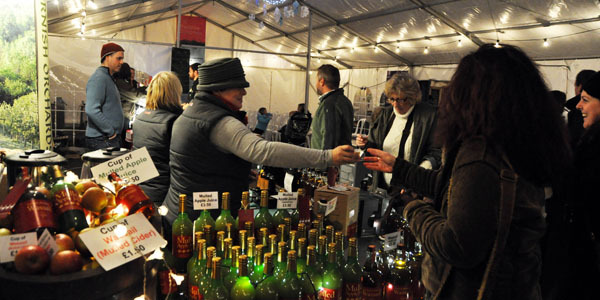 Afterwards you can warm frosty hands with a glass of mulled wine whilst stocking up on your festive wine selection. Carols in the Drang will be held at 7pm on Friday 6th December 2o13. The demonstration line-up at Padstow Christmas Festival reads like a ‘who’s who’ of the cheffing world, which makes it pretty hard to pick just one chef. 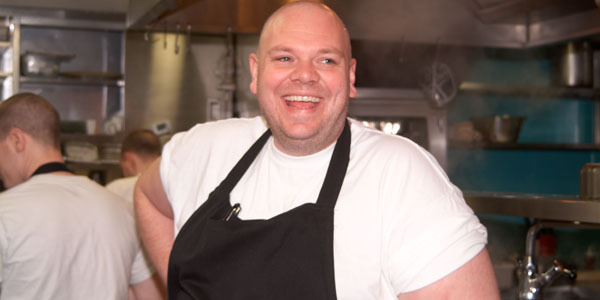 Yet after much deliberation our festival pick has to be the man of the moment, Tom Kerridge. Fresh from his BBC Two series and accompanying book Proper Pub Food, Tom has had a great year. His restaurant, The Hand & Flowers in Marlow is the only pub in the UK to have two Michelin stars and was also voted Best Restaurant at the 2013 National Restaurant Awards. It’s Tom’s first time demonstrating at Padstow Christmas Festival and he is definitely our one to watch. Catch Tom Kerridge on Saturday 7th December in the main marquee at 5.45pm. Free entry. 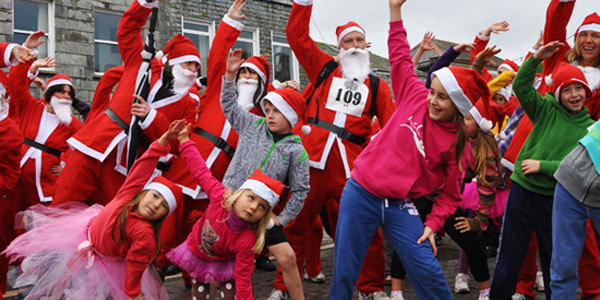 Saturday will see Padstow’s quayside awash with Father Christmases for the Santa Fun Run. This annual event attracts hundreds of runners of all shapes, sizes and ages who raise funds by tackling the one and two mile routes. Cornwall Hospice Care provide specialist care and support to adults in Cornwall with life-limiting illnesses, along with their families, friends & carers so it is a great cause. For the first time there will also be a Santa Cycle from Wadebridge along the Camel Trail to the finish line in Padstow. Registration costs £10 for adults and £5 for children and includes a free Santa suit. Don’t worry if you aren’t feeling quite up to the challenge, you can still do your bit by cheering runners and cyclists over the finish line. Hundreds of Father Christmases warming up en masse is also quite a sight to behold. To get involved and for more information visit: www.cornwallhospicecare.co.uk. The Santa Fun Run is taking place on Saturday 7th December 2013 at 1pm. Registration begins in The Old Ship Hotel from 11am. Pioneered by Padstow chef Rick Stein, the festival’s food forums are a great way of hearing what your culinary heroes really think about the ‘foodie’ issues of the day. Past debates have focused on the price of milk and whether fish can ever truly be sustainable. This year Saturday’s food forum focuses on gastronomic trends. From sun-dried tomatoes and rocket abuse, to truffle oil with everything – who’s responsible: chefs, foodies or journalists? 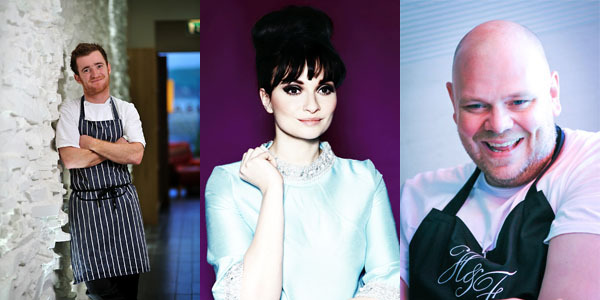 The line up features Jack Stein from The Seafood Restaurant, The Sunday Times chef Gizzi Erskine and Tom Kerridge. Food Forum – gastronomic trends is taking place at 5pm on Friday 6th December in the main marquee. Hi Pix, sorry, we made a mistake – the gastronomic trends food forum is on Friday at 5pm, not Saturday. Here is the website link for details of all food forums: http://www.padstowchristmasfestival.co.uk/festival-pro/food-forums-2013/. All demos and food forums are free, and there is no booking – it’s first come, first served. Thanks Pix. I’m glad you spotted my mistake. In my excitement it seems I got my days a little muddled. See you at the festival. Brilliant summary Kate – Thank you! It is all so exciting ! I think there will be around 13 michelin stars in town over the weekend…lucky Cornwall!! Thanks Emma. It’s going to be great. See you there.